The connection of the Haftorah to the Parsha: The prophecy of Michah recalls some of the ways in which Hashem protected the newly emerged nation during its forty years in the desert wilderness. Among the incidents mentioned by the prophet is Balak's plot to have Balaam curse Israel, and Balaam's advice to use lewdness as the bait to lure Israel into Idolatry. Thus, this is an appropriate Haftorah for the Sidrah of Balak. The storyline of this week’s Haftorah: The Haftorah begins with the prophet Michah predicting that prior to the war of Gog and Magog the mighty nations of the world will assemble against Israel. The Israelites will be like “dew” unto the nations and “Rain” to all Humankind. The Israelites are likened to a Lion, fearless and powerful. The Jewish people will not expect their salvation to come from any person; instead they will rely only on Hashem for their salvation, and the nation of Israel will triumph over all the nations of the world. 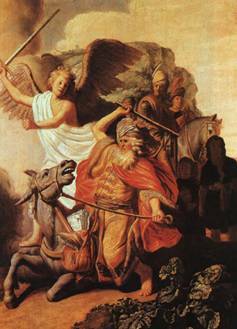 Michah predicts the purification of Israel; after the war of Gog and Magog, Hashem will remove all the weapons of war from Israel because they will not be needed any longer. In the same vein, Hashem will eliminate sorcery, fortunetellers, and idols, including the Asherah trees because all the people in the world will realize the one true God. Israel is accused of not listening to Hashem's commandments, even though they had been warned many times. Hashem asks "Is this how you thank me for taking you out of the land of Egypt?" "Is this how you thank me for protecting you from the King Balak of Moab?" "Is this how you thank me for the way Bilaam answered them?" Michah concludes the Haftorah with advice regarding what Hashem seeks from us. It is, to perform justice, love kindness and walk humbly with Hashem. Rembrandt’s depiction of Bilaam striking his donkey while on his way to curse the nation of Israel. Lived in the 8th century B.C.E., about 2800 years ago. He was from a country town of Morashet-Gat, near the Philistine border in Judah, which was a 1-day journey from Jerusalem. Morashet-Gat is marked on the Madaba mosaic floor map. Micha was a village person who detested the capital cities of Samara & Jerusalem that symbolized luxury & graft that had corrupted the nation. His book is included in the Trai-Assar, the book of the twelve prophets. He prophesied in the kingdom of Judah during the reigns of Jotham, Ahaz, and Hezekiah. Isaiah, Amos, and Hosea were also alive at this time. Of the 613 mitzvoth told to Moses, Michah stressed three. "It has been told to you what Hashem requires of you. Only to do justly, to love kindness and to walk humbly with Hashem." Was the first prophet to predict the destruction of Jerusalem. Michah warned the Israelite people against worshipping foreign Gods, which were made by the hands of the men and women who worshipped them. Michah was especially focused on the leaders of Israel who were corrupt and taking advantage of the population. Michah never questioned the justice of severe punishment given by Hashem. Michah repeatedly mentions the revival of heathenism under King Menashe, which worshipped the Baal idol. He was a spokesman of the poor, believing that true faith comes from the heart and not from formal (costly) sacrifices. Michah looks forward to the Messianic period and kingdom. Haftorahman's Lesson of the Week: Credibility is very important. When taking the role of a spiritual leader, make sure that you represent Hashem in the way he would want you to. (See Torah for guidelines.) When choosing a spiritual leader, choose someone who will inspire you to take the next step, and become closer to Hashem. 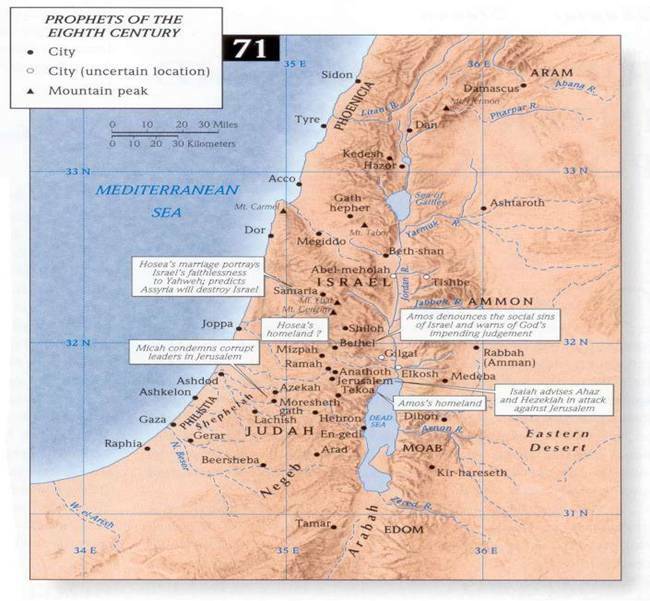 Timeline: Michah Prophesied during the Jewish years of 3150-3200. Map: The Haftorah takes place in Jerusalem.